There is nowhere better to experience seasons at one and the same time. 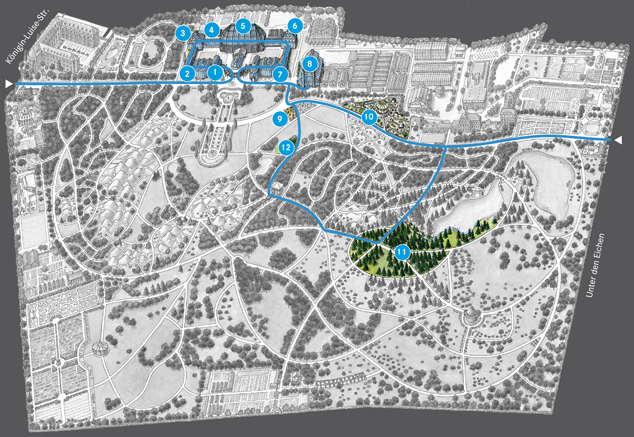 By following our suggested route, you will discover those plants and parts of the Botanic Garden that are now at their most beautiful. Of course you will also find many plants that are well worth seeing in other parts of the Garden too. Plants bloom, smell and fruit earlier or later in the year depending on the weather conditions. We wish you a pleasant trip through the plant world. 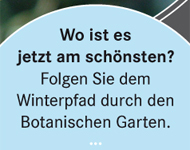 Escape the Berlin winter and retreat into the lush plant world of more southern climes in the greenhouses! Start in the African desert with its innumerable species of aloe, kalanchoe and succulent euphorbia. 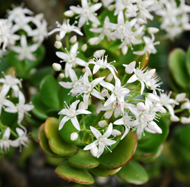 A highlight during the cool winter months is the Jade Tree’s splendid display of white blossom. After passing through the cactus-filled American desert, the trail continues on to the Cape region where, after the onset of the rainy season, many plants begin to bloom. 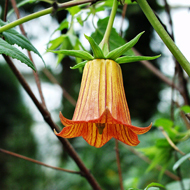 Take delight in heathers, bulbous plants such as the small Cape Cowslip, and of course the Bird of Paradise flower. 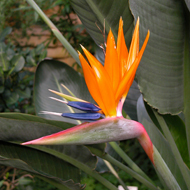 Its scientific name Strelitzia reginae was bestowed in 1789 in honour of the then British queen Sophie Charlotte of Mecklenburg-Strelitz, a German-born princess. 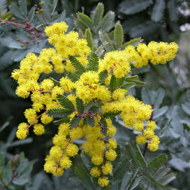 In Australia it is now summertime: you will be enchanted by blooming Spider Flowers and the brilliant red of the Kaka Beak, while the eucalyptus and the golden-yellow spherical flower clusters of the acacia compete with one another to perfume the air. 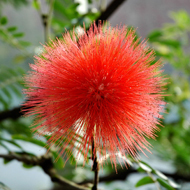 It may interest you to know that the latter are falsely sold in the flower trade under the name ‘mimosa’. The primeval tree Wollemia nobilis, which was only discovered a few years ago, is also to be marvelled at here. Step into the East Asian spring with blooming azaleas, Chinese primroses, Winter Jasmin and camellias. 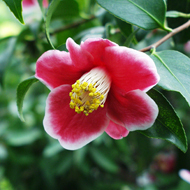 In their native habitat wild camellias are mainly pollinated by birds that have no sense of smell. Their flowers are indeed a magnificent sight, but have hardly any scent. Numerous species of citrus fruit trees on the other hand release the intense scent of their blossoms and bear fruit at the same time. 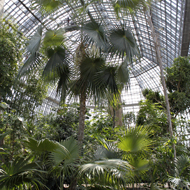 Experience tropical warmth and humidity in the Main Tropical Greenhouse. There are no seasons in the tropics as there are in our part of the world, but at most an occasional alternation between dry and rainy periods. This makes it possible to observe a wide range of different plants growing, blooming and fruiting here all year round. If you walk past the begonias and passion flowers you reach the tropical useful plants. Plants that yield winter spices such as cinnamon, ginger and cardamom are represented here alongside sugar cane, coffee, pepper and the coconut palm. 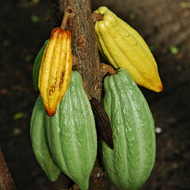 The fruits of the Cocoa Tree grow directly on the trunk and provide the raw material for chocolate. In the orchid house you will find clear evidence that vanilla is also a member of this plant family. Then go down the stairs to the left and delight in the blood-red flower heads of the Red Powder Puff, which in their native South American habitat attract hummingbirds, thus ensuring pollination. Roam further through the humid tropics and the varied world of the ferns until you come to the bromeliads, a plant family that includes the pineapple along with many other popular ornamental plants. Go out briefly into the chill winter air before seeking sanctuary in the Mediterranean Greenhouse. All round the Mediterranean the winter brings extensive rainfall, allowing Cyclamen, Branched Asphodel, Cretan Arum and many other plants to bloom. On the Canary Islands – the ‘islands of eternal spring’ – Viper’s Bugloss, Sow Thistle, various species of spurge and aeonium as well as the symbol of the islands, the Canary Island Bellflower, are now all in bloom. Pay a visit to the winter-hardy cacti in the open air. 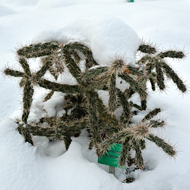 These cacti, which successfully withstand the Berlin winter, grow wild right down into southern Canada and are suited to comparable winter weather conditions. On an information board nearby you will find out how these cacti are able to survive the frost. 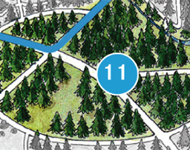 Even the outdoor areas present trees and shrubs that bloom during the winter. 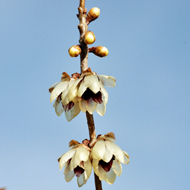 In the touch and scent garden, the Wintersweet unfolds its bewitchingly fragranced flowers and even attracts insects. Only a very severe frost will damage the flowers. The yellow blossom of the Winter Jasmin has no scent, however, in contrast to most members of the genus. 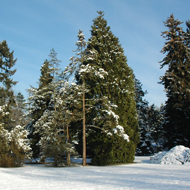 The conifers in the arboretum demonstrate the great variety of commercially available ‘Christmas trees’. 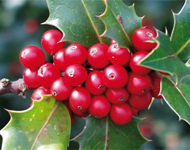 Their mainly scale-like and needle-like leaves are ideally suited to the winter cold. Outdoors, they remain on the tree for several years, but in the centrally heated atmosphere of the Christmas living room they very soon start to drop off. 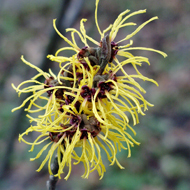 The Chinese Witch Hazel fully deserves its German common name of ‘Magic Nut’: in the middle of winter its buds open and its narrow petals unfurl in the sunshine. The flowers exude an intensive smell and attract insects. If there is a further cold snap, the delicate petals roll themselves up again. The flowers are able to bear frosty conditions as low as -10°C without suffering any major damage.